North Carolina's own Elizabeth Edwards has teamed up with with MoveOn.Org and Emily’s List to promote electing more women to Congress. Health care is an issue that is really close to my heart. And I know it matters to a lot of Americans, particularly mothers. But time and again, Republicans have blocked progress on expanding health care—most recently the expansion of the children's health insurance program—and on so many other important issues. That's why we need to elect more progressive women in Congress in 2008, to stand with President Obama on healthcare and other key issues. McCrory: What Would Andy Say? Read more about McCrory: What Would Andy Say? McCrory at NC Gubernatorial Debate: More TeeVee, Less Education! Isn’t it enough that voters had to endure one “Law and Order” candidate, Republican Fred Thompson? Read more about McCrory at NC Gubernatorial Debate: More TeeVee, Less Education! NC Congressmen, Price, Watt and Miller all stood up today for the American people and the Fourth Amendment by voting against, FISA, the illegal wiring taping bill. FISA, which passed the House on a 293 to 129 vote, has been called a “compromise” by supporters when in fact, it’s merely a capitulation to Republicans and Telecom Companies. Barack Obama kicked off his General Election campaign in North Carolina and will begin running his first general election ad in the state beginning Friday, June 20th. North Carolina, Alaska, Georgia, North Dakota and Montana are among the list of GOP stronghold states in which the ad is set to run in addition to airing in traditional battleground states. The ad which will run in 18 states, clearly aims to emphasize Obama's humble roots, work ethic and love of country. The waters became fully protected by the moratorium in the fall of 2000 when Conoco gave up the last of the leases for exploration in the Manteo Exploration Unit, a group of federally leased blocks of submerged land lying about 45 miles off Cape Hatteras. Conoco had owned five leases for the submerged lands in the unit, and shared three others with Shell and Occidental Petroleum Corp. Chevron, Mobil and Marathon gave up or sold their leases earlier in 2000. None of the companies ever undertook exploration in the area. Barack Obama kicked off his general election campaign in Raleigh, NC on Monday, an indication that North Carolina will be a targeted state in the fall. Obama delivered a major speech on the economy at the NC Fairgrounds, marking the beginning of a two-week tour through the state, focusing on Economic Policy. Obama Regarding Ted Kennedy: "I Stand on his Shoulders"
There has been an outpouring of support for Senator Ted Kennedy as the sad news was delivered today, of Kennedy's malignant brain tumor. Senator Ted Kennedy recently endorsed Barack Obama, stating "I know what America can achieve," Senator Kennedy said. "I've seen it. I've lived it. And with Barack Obama, we can do it again." Senator Kennedy has "lived it." Considered the most effective Senator, he has led the way in the fight for social justice and is responsible for the passage of some of the most critical legislation of our time. Read more about Obama Regarding Ted Kennedy: "I Stand on his Shoulders"
"There is one man who knows that knows and understands that this is a time for bold leadership. There is one man that knows how to create the change, the lasting change, that you have to build from the ground up. 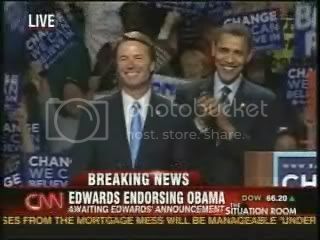 There is one man who knows in his heart there is time to create one America, not two ... and that man is Barack Obama, " John Edwards told a fired up crowd in Michigan, as he endorsed Barack Obama for President.